A proposed mixed-use project on US 1 promising new office, retail and residential uses intends to take advantage of its location at the foot of a pedestrian overpass that connects to the Metrorail Douglas Road Station. Along with being transit oriented, Platform 3750 plans a mix of workforce housing and market-rate apartments. Platform 3750 LLC proposes to build on 2.1-acres at 3750 S Dixie Hwy. Miami’s Urban Development Review Board recommended approval Nov. 16, with a few suggested tweaks. 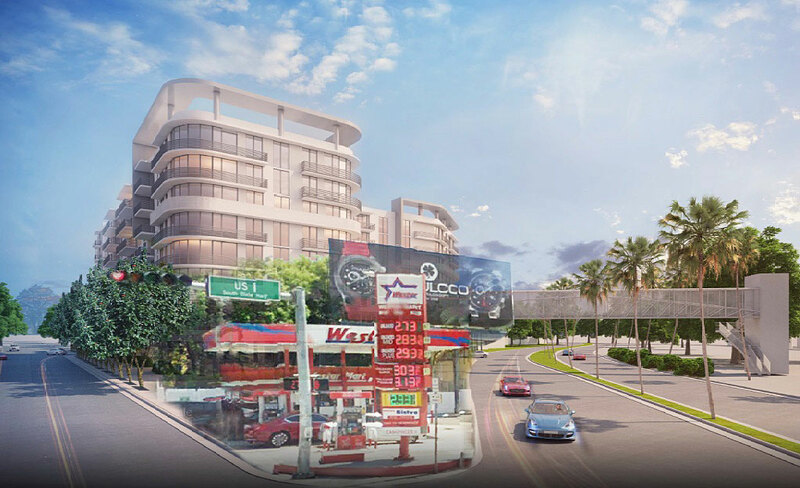 The project will transform the southwest corner of US 1 and Southwest 37th Avenue (Douglas Road), said attorney Melissa Tapanes Llahues, representing the developer. She said the development will be a new gateway to Coconut Grove. The Miami-Dade County Community Action and Human Services Department owns the land. Platform 3750 was the subject of a Miami-Dade County request for proposals. The northern portion is designated for restricted commercial use, while the south portion is for low density restricted commercial use, according to the City of Miami’s land use plan. The plan calls for a building from five to eight stories tall and about 396,751 square feet in total size. At its highest, the structure is projected to be 92 feet, 10 inches. Platform 3750 would be home to 192 residential units, 30,070 square feet of offices, 20,200 square feet of commercial and retail space, a garage for 403 vehicles and 10,863 square feet of open space. An existing gas station at the very corner isn’t part of the project and is to continue operations at that location. The developer is seeking waivers, including permission to reduce the number of required parking spaces by 10% and increase lot coverage by 10%. Board member Neil Hall asked what the workforce-to-market ratio would be. Ms. Llahues said that was still under negotiation with county officials but stood at 20% workforce units. An existing structure, built in 1967, will be demolished in order to construct the project. The county will use some of the new office space, Ms. Llahues said. The proposed retail space will focus on opportunities for businesses that provide services and jobs to neighborhood residents, she said. The proposal includes a Starbucks with drive-through service. Amenities are likely to include a spa, rooftop pool, common gourmet kitchen, in-house movie theater, coffee bistro and more. Review board members suggested limiting retail uses along US 1 in order to reduce pedestrian movement and discourage persons from crossing the busy divided highway instead of using the overpass. As conditions for the favorable recommendation, the board directed the developer to consider eliminating a curb cut on US 1, consider varying heights to break up the project’s volume, consider a corrugated metal surface rather than green landscaping for a wall in the planned courtyard and more. Don’t make it TOO inviting to people not flying by in a car! 400 parking spaces is what we call a “transit-oriented” development. Ok.